LAKE NIPIGON - ENJOY THE SOLITUDE! An echo from the past resonates in the present when you travel this ancient waterway. 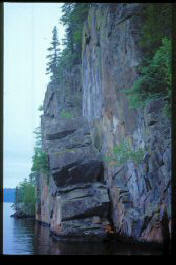 Dramatic landscapes and striking geological features are unique to Lake Nipigon. Towering cliffs and deserted sand or pebble beaches make up a large part of Lake Nipigon's spectacular shoreline. 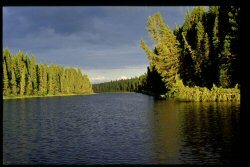 Although the Lake has been a waterway since the days of the fur trade, it remains secluded. This inland freshwater sea is the largest lake within Ontario's border. Lake Nipigon has been recognized as the largest Provincial Signature Site by the MNR's Ontario's Living Legacy Program (www.mnr.gov.on.ca). The inclusion of the lake in this protective measure will maintain its ecological and cultural significance as a legacy to the world. Rare plants flourish in areas of the boreal forest, and a variety of wildlife are native to the shorelines of Lake Nipigon. Several species of fish including brook trout, lake trout, northern pike and walleye thrive in the cold waters. The pristine shores and waterways are the backdrop to your personal adventure, whether it is a chance to relax and enjoy its natural wonder on a leisurely cruise; an opportunity for a challenging blue water kayaking experience; a fishing trip remembered as a truly world class event, or the quiet solitude and patience required to partake in a bow hunt for a majestic moose. "Unless it is cherished, the glory of the Nipigon may fade and the story of its marvelous attractions may become a tradition of the past."